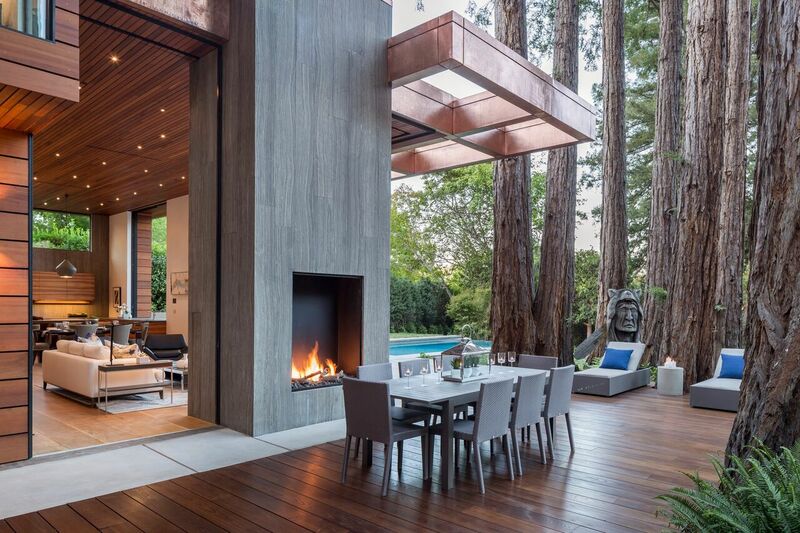 It's hard to argue against adding a fireplace to your dream home. They provide a place for your family and friends to gather, and the flickering flames are captivating, allowing us to sit, relax, and enjoy the moment. Fireplaces can also be an economical way to heat your home as many of the best ones will have air tight doors or are sealed with glass for maximum efficiency. So, you’ve decided that your home needs a fireplace, but the second decision is whether to go with a wood burning fireplace or a gas fireplace. You really can’t go wrong with either choice as they both carry unique pros and cons. Even so, if you’re torn between the two different styles, here are a few things to consider to help you make your decision. What Designs Do You Like? Because you’ll look at or use your fireplace regularly, you should make sure that you’re getting a fireplace that is appealing to you and complements your home’s interior design. Many people enjoy the traditional look of an open-hearth fireplace while other people want something more modern like a glass-on-glass see through fireplace. Whatever the case may be, choosing a fireplace that appeals to your design aesthetic should be one of your first decisions. Keep in mind that when you work with the best, experienced custom fireplace manufacturer, they will work with you one-on-one to help design a fire feature perfect for your home. And if you’re looking for a modern or contemporary fireplace, you don’t have to choose gas, there are modern wood burning fireplaces available to complement any space. You can use a fireplace for a variety of applications. Some people choose a fireplace because they want to add a touch of luxury to their home while others want a traditional wood burning fireplace that they can use to cook meals on occasion. 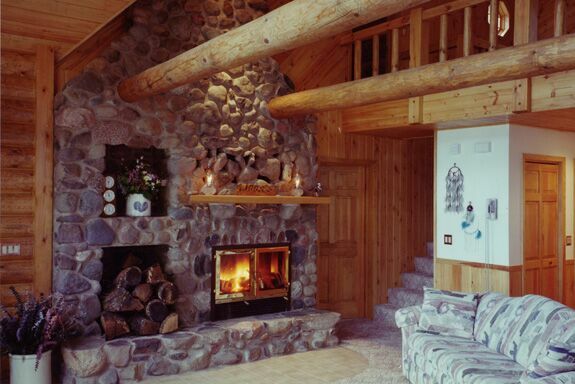 Also, many wood burning fireplaces can provide supplemental heat and assist with heating your home. Or maybe you just want to watch the flames dance and flicker on a cool evening. Everyone wants a fireplace for different reasons, and understanding what you want to get out of your new fireplace is essential in making the final decision. Consider what makes a fireplace so appealing to you and include those factors it in your final decision. What Experience Are You After? Last, but certainly not least, the experience you desire is essential to making your decision. With a wood burning fireplace, you get the experience of chopping your own wood and using it to build a fire. Some people receive great satisfaction from this experience as they sit and enjoy the smells of wood burning and listen to the fire pop and crackle; while others may want a gas fireplace that turns on and off quickly in a simple manner. There is no right or wrong answer, and it all comes down to personal preference. Consider what you enjoy most about fires and the fireplace experience and look for a model that suits that need. Whichever choice you make, working with a custom fireplace manufacturer makes it easy to create a fireplace that suits your needs. They’ll work with you one-on-one to understand your design needs and will provide you with recommendations and options so you can create the perfect fireplace that you’ll enjoy for years to come. 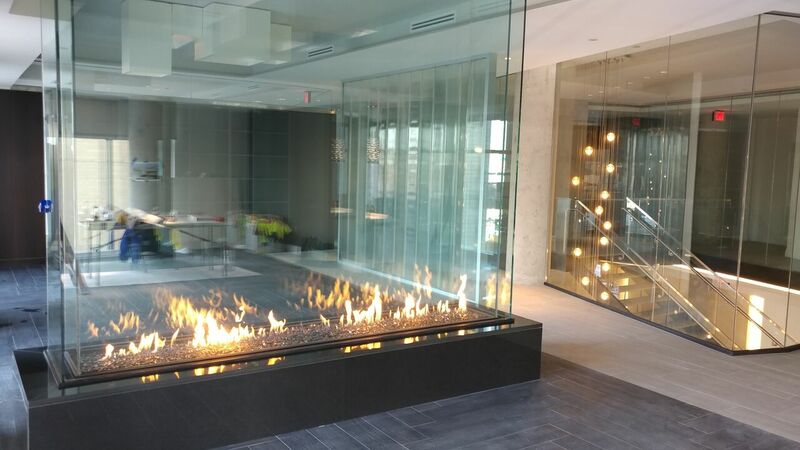 For over 40 years, Acucraft Fireplaces has designed and built innovative fire features that perfectly complement a variety of interior designs in homes or commercial spaces. From traditional wood burning fireplaces to their modern see through fireplace collection, they do it all. 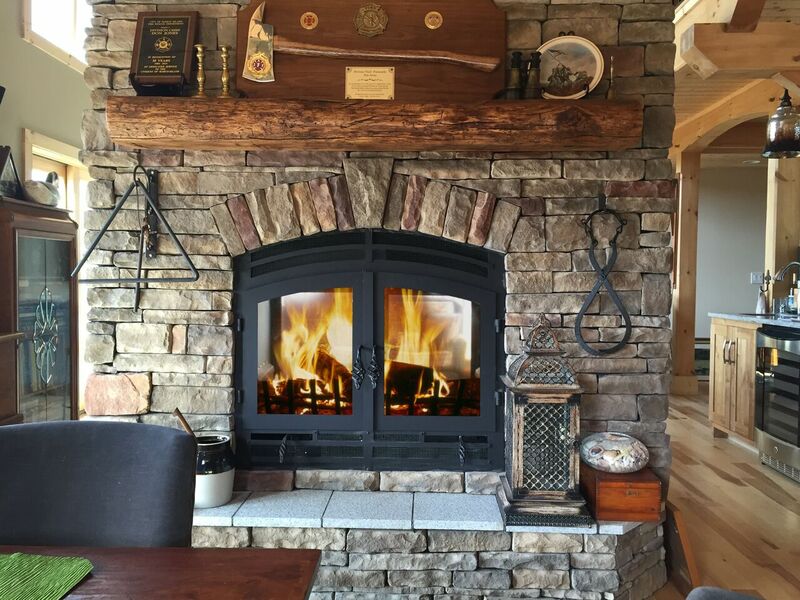 Acucraft specializes in custom fireplaces, and their team of design specialists will work with you one-on-one to create the perfect fireplace for your dream home or for a project you're building. Whether you have existing dimensions and build plans or want to build the room around the fireplace, Acucraft Fireplaces is ready to work with you. When you’re trying to heat your home or even just keep a part of the house warm without relying on an expensive heating system, the hotter and longer lasting the fire the better. Make sure that you use seasoned hardwood to ensure you’re getting the most out of every log. One of the primary appeals of a wood burning fireplace is the ambiance the sounds create. The pop and crackle of wood appeals to our senses in a primal way, and there just isn't anything that can quite compare. While all wood types will pop and crackle, if you are after a symphony of natural burning sounds, then a softwood could be the way to go. Softwood dries quickly and will typically produce larger flames and more crackling fires. Keep in mind that softwood isn't the most efficient for producing maximum heat and the fires don't last quite as long. Also, since the pops and crackles can typically throw sparks, make sure your fireplace either has a screen or ceramic glass door for safety. While softwood isn't always recommended for fireplace efficiency, if you want a loud fire, it's the way to go in many cases. While fires are pretty to look at, they also serve as interactive ways to cook. If you decide that you want to grill over your fire or use a cooking arm to warm up a pot of soup or tea, you should look for a super-hot, long-burning fire. To get this type of fire, hardwoods are recommended because they tend to produce the most amount of coals—perfect if you're planning on using a Dutch oven or similar cooking method. Let the fire burn down and the flames subside a bit, and then you're ready to get cooking. If you live in a warmer climate or you’re pinched for time but would still love to enjoy a brief fire, softwoods like Douglas Fir, Yellow Pine, Cedar, and White Spruce are among the best options. They tend to burn much quicker than hardwood—a pro or con depending on your needs—which is why it’s important to know the kind of fire you’re after. Also, you can mix different types of woods too as softwoods are great starters as they ignite quickly, and the hardwood can keep the fire going. Whatever type of fire you’re after, make sure that you’re burning it in premium fireplace built to last. No matter what type of wood you are burning it should always be dried, split, seasoned wood. Using wood with a high moisture content can cause an abundance of smoke, and can cause creosote build-up in your chimney, which can ultimately lead to a fire if your chimney isn’t swept annually. Fireplaces are often the focal point of any home, where guests naturally gather. Aside from being a centerpiece of your home, your fireplace can provide as a great source of heat, and with the right configuration, you can use it to warm the entire home, which you may need if the power goes out. Even so, not all fireplaces are created equal, so as you shop around for fireplace manufacturers to bring your vision to life, here are a few things to keep in mind. First, you should consider the style of the fireplace. The best fireplace manufacturers will offer fireplaces in various configurations with enticing materials and premium touches. With nearly limitless options available, you’ll want to determine what fits your aesthetic the best, and what you’d like to get out of your fire feature. For example, if you’re looking for a way to connect your indoor space with the patio, a see through fireplace could be the perfect option. Or if you want a more traditional aesthetic, then perhaps a single-sided wood burning fireplace could be the best choice. For best results, choose a fireplace that will complement your space and still meet your needs. The second thing to consider is your fuel source. 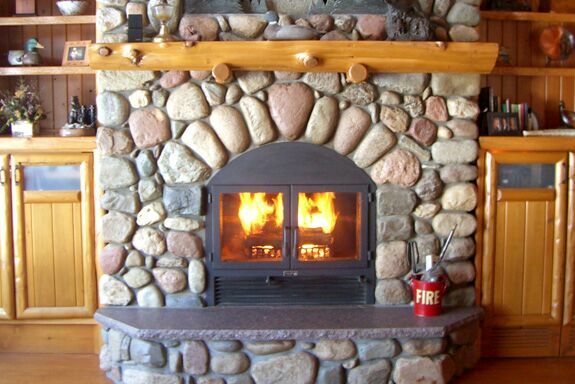 With most fireplaces you typically have three options: natural gas, propane, or wood. Each of these options offers unique benefits, and finding the right one for you will depend on your space. If you crave the crackle and pop of a traditional fire, then a wood burning fireplace is the best option for you. On the other hand, if you don't want to worry about stoking a fire or hauling wood then a gas fireplace may be the best solution for your space. Over the years, fireplace technology and options have come a long way, and these days, you'll find that custom fireplace manufacturers offer a wide variety of premium features to help you get the most out of your fireplace. For example, if you have young children running around, a glass cooling system with safe-to-touch glass may be the perfect option for you. Or, if you’re looking for something truly unique, enjoying the dancing flames of an open fireplace with removable fire screen could be the exact thing you’re looking for. Your new fireplace should last a lifetime, allowing you to create endless memories. For this reason, the quality of your fireplace is paramount. Most off-the-shelf products won’t last a lifetime, but when you work with a custom fireplace manufacturer, you’ll feel at ease knowing only the highest quality materials are being used for your fireplace. By working one-on-one with designers and experts to custom create your dream see through fireplace with premium materials, you’ll have a fire feature that will stand the test of time. Another important factor when looking for fireplace manufacturers is to seek one that offers lifetime warranties on their fireplaces, giving you peace of mind. With regular maintenance and inspections your new fire feature can provide you with a lifetime of enjoyment. Fireplaces have been around for centuries and fires have been a natural gathering point for even longer. Adding a gas or wood burning fireplace to your home provides a variety of different benefits, but choosing a custom-made fireplace can offer even more. Here are a few reasons that you should consider adding a custom fire feature to your home. No matter the type of fireplace that you choose to add to your home, it will add warmth to your space, particularly during the colder months. Fireplaces offer an especially cozy form of heat, and there isn’t an experience quite like enjoying the warmth of a fire with family and friends. A fireplace is not only cozy, but it’s also efficient and practical. You can integrate a wood burning fireplace into your existing heating system as a supplemental heating source to help warm your home. This can save you tremendously in heating costs over the long run depending on the size and layout of your residence. The beauty in a custom fireplace is that it not only provides the practical benefit of keeping your home warm, but also adds a design element sure to capture attention. Over the years, fireplace designs have evolved from the traditional open-hearth design, and while many people still love and appreciate the simple design aesthetic these models provide, when you choose a custom fireplace manufacturer, you have many more options to bring your exact vision to life. For example, if you’d like to warm up two rooms and add a unique design element, consider a see through fireplace. This innovative fire solution can connect two rooms and provide a stunning feature in both while providing warmth. The only limit is your imagination when it comes to creating your dream custom fireplace, and when working with an experienced custom fireplace manufacturer, their design team can help bring your vision to life. If you decide it’s time to sell, or you want to rent out your home, having a custom fireplace you’ve enjoyed over the years is a worthy investment that will make your home more attractive to potential buyers and renters. In fact, according to U.S. News and World Report, 68% of real estate agents reported that fireplaces can increase a home’s value. Not all homes feature a fireplace, and when you choose a custom one with the design and practical benefits that they offer, buyers and renters are sure to notice. Finally, a custom fireplace can bring together a room and create a place for your family, friends, and guests to gather. During the colder months, the warmth of a fire is hard to resist. And, no matter the season, a well-designed fire feature will remain a beloved feature of your home indoors or out and keep everyone cozy. Fireplaces can be the centerpiece of any room with the right innovative and sophisticated design. Acucraft Fireplaces specializes in designing and building a variety of different fireplaces including the classic wood burning fireplace and a variety of see through fireplace models along with a cozy outdoor gas fire pit. Every fireplace they build starts from the ground up, so homeowners and commercial builders can design a fireplace that perfectly complements their existing design plans. As the days grow shorter, the nights grow longer, and the temperature continues to drop, you’re likely hunkering down inside to enjoy your fireplace. But what if there was a way to enjoy your outdoor space, even during the winter? With an outdoor gas fire pit, you can relax and stay warm on your patio year-round. You might enjoy it so much that it could serve as a focal point at your next holiday party. To make sure you’re 100% pleased with your outdoor space, seek out a business with experience in helping people design custom fire features for their unique spaces. You’ll want to make sure you can also choose from a variety of customizable fire pit models that come in linear, circular, or arc-shaped designs to perfectly match your existing outdoor space. Look for the option to design an outdoor gas fire pit that is made with 100% stainless steel components so you’ll know its built to last. You’ll also want the freedom to select your desired size and configuration. And, if you want to get really creative, make sure you can also select your preferred media options, such as crushed glass, river rocks, or logs. Regardless of whether you want to host a memorable holiday party or just enjoy your patio, an outdoor gas fire pit is the perfect focal point for an outdoor space. You and your family can gather on cold nights and enjoy the soft glow of the fire while spending quality time together. Just envision drinking hot chocolate or mulled wine, may be roasting s’ mores or other delicious holiday treats, and admiring winter’s subtle and sometimes underrated beauty. Or, if you are feeling festive, add a holiday wreath, a few garlands, and a nice candle arrangement, and have yourself a jolly holiday party. Your guests will love the idea of mixing the holiday festivities with winter’s natural elements, and the outdoor fire pit will be the perfect focal point for guests to gather around and enjoy some festive holiday treats and drinks. There are also so many ways to decorate around your outdoor fire pit for the holidays. If you want to go for a simple design, add a candle arrangement with aromatic scents like cinnamon, pumpkin, vanilla, and nutmeg, and arrange them near the fireplace for a multi-dimensional look. This will add a nice holiday scent while still keeping the fireplace the central focal point. Also consider incorporating subtle holiday colors, like frosty whites, silver, evergreen, and gold. Again, your guests and family members will appreciate the holiday subtleties without overpowering your fire feature’s beautiful design. Acucraft Fireplaces designs modern, innovative, and inviting fire features that are sure to be the focal point of your space. With a focus on innovation, collaboration, and advanced technologies, Acucraft Fireplaces will work with you to create the simple, modern, or classic fire feature you envision with a team of skilled fireplace advisors and designers. Their collaborative team will help you find the perfect fire solution for your space, whether you’re in search of a traditional gas burning fireplace or an ultra-modern see through fireplace. · Burn up to 50% more efficiently than older models, which can save you money on your energy bill. · Use a third less wood fuel while producing the same amount of heat. · Reduce creosote build-up (oil distilled from coal tar that is often used as a wood preservative), which can reduce the risk of chimney fires. · Lower the levels of carbon dioxide, methane, and other sources of particle pollution both inside and outside your house. 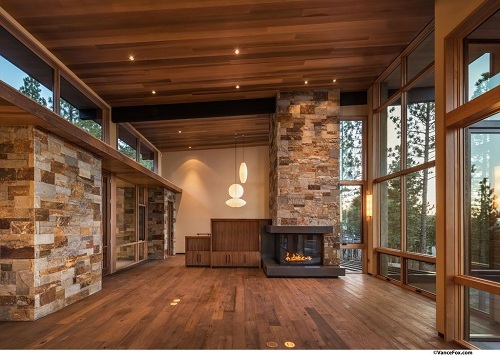 While increased efficiencies, improved air quality, and superior heating are all positive attributes of the modern wood-burning fireplaces, we all know that these fixtures are much more than a heating appliance. These days, the aesthetics of a wood-burning fireplace is just as important as its function. With sleek, elegant designs and bold architectural statements, wood-burning fireplaces can add sophistication and dimension to an otherwise ordinary space. Wood-burning fireplaces come in graceful, customizable designs that complement your space. You can select from an indoor/outdoor wood fireplace, single-sided wood fireplaces, and a see through fireplace design. All of these fireplace styles capture the traditional warmth of a wood-burning fireplace while offering the advanced, highly-efficient performance of a modern appliance. If you’re unsure which fire feature would work best for your space, you can draw inspiration from design rooms and model homes that feature both the utility and aesthetic potential of a wood-burning fireplace. This can help you visualize how a new fireplace will work with your existing space. You can also work with a custom fireplace design company, such as Acucraft Fireplaces, to bring your vision to life. By working with an experienced company with a dedicated design team you’ll be able to see your dream fire solution come to life at every step of the process. 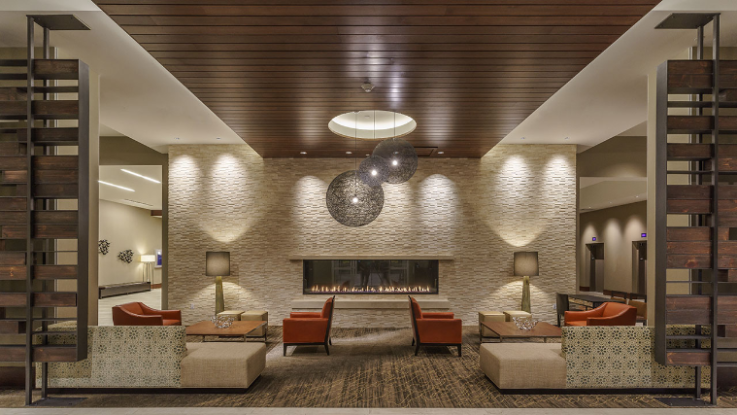 Whether you want a sleek, modern gas model or a more rustic see through wood fireplace, Acucraft Fireplaces will enhance the style of your home or commercial space with luxury design. A see through fireplace and other customizable designs can easily become the focal point of your home or office. Two-sided fireplaces create a multi-dimensional design that can open up your space, transition between multiple rooms, and add a touch of comfort to a gathering space. Gone are the days of sacrificing efficiency and design for the sake of utility. Today’s fireplaces are works of architectural art that can revamp your space with a sleek, modern, and energy efficient touch. 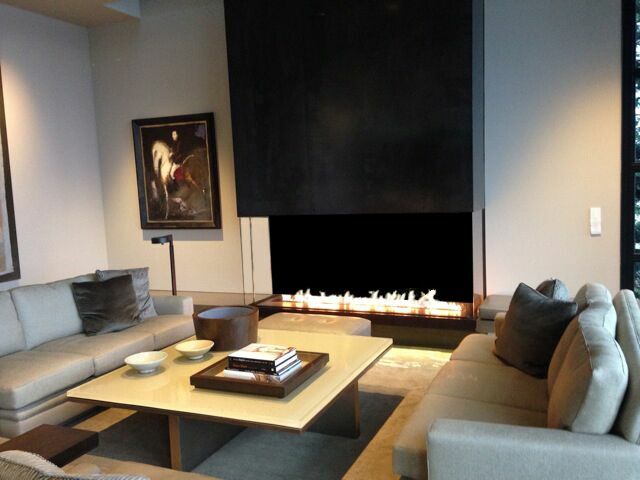 Acucraft Fireplaces has been designing customizable, modern, innovative fire solutions for over 35 years. Rooted in collaboration, working with Acucraft Fireplaces to create the fire feature you’ve always dreamed of is simple as their skilled design team will employ your vision every step of the way. Acucraft Fireplaces will create the perfect fire solution for your space, whether you desire a cozy outdoor gas fire pit or an eye-catching see through fireplace. No matter how well you plan, the weeks between Thanksgiving and Christmas always seem to fly by. Between traveling, shopping, holiday parties, school and work events, and the holidays themselves, sometimes decorating can fall to the wayside. For example, researchers postulate that people can generate and associate meaning when they experience a designed space like a Christmas tree or festive room, and this cognitive association can help develop positive relationships with others that also experience that space. Designed environments can also facilitate shared experiences, including serving as a backdrop for activities, conversations, and gatherings. Researchers have tested these hypotheses too. In one case, families that routinely visited a nursing home raised concerns over the lack of aesthetic spaces, including poor lighting, colors, and designs. Researchers followed patients’ reactions as the nursing home upgraded the interior, and after two years noted an increase in socialization among residents and family and greater independence among residents. While it might seem like a stretch to ascribe such value to a few holiday decorations, there is something to be said for how a designed space contributes to a festive experience. So, although time is still likely to be a luxury this holiday season, you can maximize your decorations with these simple tips. The easiest way to save time while decorating is by focusing your energy on a main fixture in the house instead of trying to decorate each dimension of a room. This will not only cut down on the number of decorations you need, it will also draw attention where it naturally flows. Whether it be a grand dining room table or the mantle of a see through fireplace, a designed space that naturally accentuates the most noticeable feature will create an easy, festive ambiance. A simple candle arrangement is another easy and festive way to curate a designed space. The soft, natural light, combined with aromatic holiday scents, will create a welcoming, festive design that will easily transition from November, December, and into the new year. Look for candles in fall and winter scents and colors, such as cinnamon, pumpkin, warm vanilla, plum, and cranberry. For an added touch, layer the candles with different pillars and centerpieces for a more dimensional look. Perhaps the most efficient way to maximize your holiday decorations is to select colors that seamlessly transition from Thanksgiving to the winter holidays. Wreaths with neutral earth tones like evergreen, brown, and leafy oranges are a great way to capture a crisp festive feel. Gourds, pears, citrus, garlands, and frosty pine cones are also timeless holiday décor that can easily elevate a designed space for the entire holiday season. If you live in a more temperate climate or you just want to cozy around a central gathering space, utilizing an outdoor gas fire pit can also capture the coziness of the winter holidays. Companies like Acucraft Fireplaces can design a modern, see through fireplace that can extend your living space beyond the walls of a room. They can also create a cozy outdoor gas fire pit to add a touch of modern and festive elegance, customizable to your unique outdoor space. Add a few festive garlands and frosty pine cones, and you will have yourself a versatile holiday space uniquely designed to celebrate the holidays. Acucraft Fireplaces has been designing customizable, modern, innovative fireplaces for over 35 years. Rooted in collaboration, working with Acucraft Fireplaces to create the fire feature you’ve always dreamed of is simple as their skilled design team will employ your vision every step of the way. Acucraft Fireplaces will create the perfect fire solution for your space, whether you desire a traditional gas burning fireplace or an ultra-modern outdoor gas fire pit. That soft change from summer to fall offers a welcome reprieve from the summer heat, replacing that sticky air with cool mornings and vibrant foliage. For many though, fall is also a time of reverence where thousands of faithful followers congregate in holy devotion to college football. If college football is followed like a religion in your household, then Saturday is a High Holy Day. Imagine an outdoor space customized flawlessly for college game day, replete with an outdoor TV, your favorite game day chair, and an outdoor gas fire pit to keep your guests warm when the afternoon temperature starts to dip. An outdoor fireplace can transform your back patio into a game day haven that rivals any sports bar or tailgate party. Look for a fireplace company that connects you directly with a professional designer to create a customized residential outdoor gas fire pit that perfectly fits your outside space. You’ll also want the ability to select your control preferences and internal and external materials to create that perfect game day ambiance. Customized configurations to complement your space and vision. A variety of finish options, including marble, stone, and tile. The choice between manual or electronic ignition. Different media options, including crushed glass, river rocks, or logs. The option to add a half-inch tempered safety glass window. Depending on the size of your game day gathering, guests could easily flow between rooms inside your home as well as your outdoor space. Fortunately, a see through fireplace is the perfect way to connect two spaces, letting the touchdown celebrations reverberate far beyond the flat screen. A see through fireplace creates a clean, modern look in any room, adding subtle warmth and natural light in and between spaces. 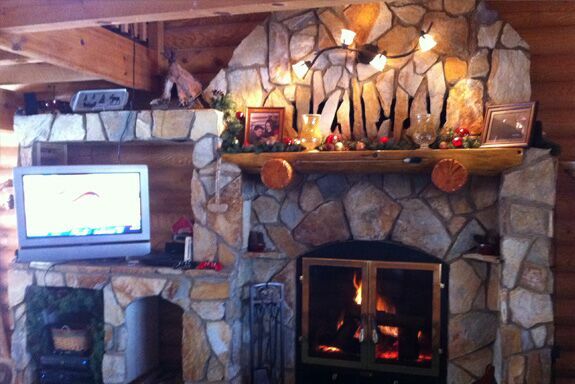 Seek out a fireplace company that offers customized designs that can accommodate any size or shape preference. Make sure that each design can be manufactured with open, sealed, partial glass, glass cooling, and air shield options. Ideally you can even opt to include reflective porcelain panels within the firebox to reflect the flame. If your mounted flat screen TV serves as a game day fixture but your fellow fans overflow into neighboring rooms, a see through fireplace can flawlessly connect your adjoining spaces and create a complete game day experience with multiple vantage points. Make sure the company you work with creates see through fireplaces that are equipped with four safety checkpoints that must be met before the system will ignite. Added technology such as a glass cooling system will also make it safe for children. Additionally, a see through fireplace makes for a great home heating option, one that can add a touch of warmth much faster than most central air systems. If the college football season has you wanting to spend Saturdays outside but you’re not quite ready to face the cold, an outdoor gas fire pit is the perfect way to stay warm and cozy throughout the game. Consider what fire feature will add the most warmth and ambiance to your living spaces and be sure to work with an experienced company to make your game day dreams into a reality. Keep a basket of cozy, flannel blankets in a convenient spot on your patio to stay warm during chilly nights. Store the basket in a dry area to avoid mildew and mold. Tartan blankets are a Scottish cloth with crisscrossing horizontal and vertical bands of colors. If you have Scottish heritage, do some research and find out which tartan pattern aligns with your clan. These timeless designs bring a warm and nostalgic feel to your patio design. Add a couple of outdoor canvas pillows to your patio chairs or an outdoor sofa set. Combined with the tartan blankets, you and your guests will stay cozy despite the weather in colder months. Create some mood lighting with strategically placed, free-standing glass lanterns around your outdoor space. Insert pillar candles inside and light them on a chilly October night for a romantic feel. String globe bulb lights across the length of your outdoor space or around mature trees. These work great year-round for a cozy outdoor atmosphere, so you don’t have to remove them when the snow starts to fall. Depending on your style, choose a patio dining set or seating set that reflects an ultra-modern or timeless traditional feel. Choose pieces that will work year-round and will withstand all types of weather. The weather in your area might be extreme during winters, which might make storing your patio features a smart idea. But if you experience seasonal transitions that don’t require snowblowers or monsoon preparation, a sturdy and durable set of outdoor furniture creates a comfortable setting for patio entertainment all year long. For a more rustic theme, arrange some hay bales and cornstalks around your patio. Hay bales make for great seating when you lay flannel blankets on top of them and add a pillow or two. Be careful about placing these highly flammable materials near fire pits, a see through fireplace, or other heated features. Cornstalks and hay bales add a touch of rustic nostalgia to any patio space for the autumn months and are perfect for cozying up to the warmth of a fire with a cup of hot apple cider or your favorite fall beverage. 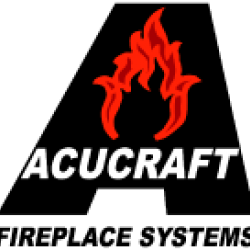 For over 35 years, Acucraft has been designing, building, and burning wood and gas fireplaces. Through their innovation, collaboration, and investment in technology, they offer their customers nearly limitless options for their gas or wood burning fireplace. Working with Acucraft Fireplaces to create the fire feature you’ve always dreamed of is simple. Acucraft’s skilled design team will assist you every step of the way. 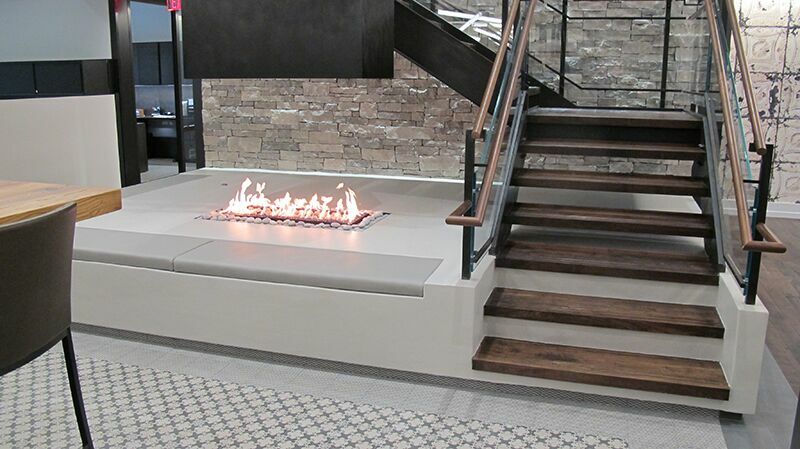 Completely customizable, their fire features are designed for your space and style. So, whether you’re in search of an outdoor gas fire pit or an ultra-modern see through fireplace, Acucraft Fireplaces can make your dreams a reality. Accent colors work best with blankets, pillows, vases, coffee table decor, smaller wall hangings, holiday decorations, and dining table decor. With shorter days and bitterly cold weather, a fireplace is a home design essential for cozy gatherings. Create a luxuriously comfortable space around your see through fireplace in your living room. Chunky knit blankets, a tea and coffee cart, plush pillows, and a few good books help create the perfect hygge setting in your home. A transitional fireplace allows for a safe and enjoyable ambiance in multiple spaces in your home. Customize a fireplace design that works for your family's home and lifestyle, whether it’s a wood or gas fireplace. This goes hand-in-hand with the fireside nook. Invest in super-comfortable seating that makes your guests reluctant to leave your cozy, luxurious home. Whether that’s a reading chair next to your fireplace or a sectional sofa with built-in USB ports, transform your living area space to a hygge-worthy aesthetic. Don’t forget about the pillows, blankets, and side tables for hot drinks and books. Transform your bathroom by upgrading to a soak tub. It’s an investment not only for your home but your relaxation and well-being on a regular basis. The curve of a soak tub is more natural and offers a deeper soak than a standard bathtub. It allows you to be in a more comfortable position while exuding an aesthetic appeal of classic luxury and sophisticated home style. For the ultimate redesign, install a see through fireplace the sits between your bedroom and bathroom. A wood fireplace has more of a Scandinavian feel, while gas gives an effortless, ultra-modern finish to an intimate space. Candles. Candles everywhere. In all seriousness, choose a handful of candles with similar scents (or unscented, for those with sensitivities) to decorate your living room, bedroom, and bathroom spaces. Enjoy a candlelit dinner with your loved ones while the bitter cold is left outside. Candles can turn any space in your home into an oasis. Harness the natural sunlight through your windows and use window treatments that allow for privacy while letting copious amounts of natural light shine through. In the true mood of hygge, use a vintage design that invokes a nostalgic feel, like sheer white curtain panels with a solid-colored scheme.